Announcing the winners of the 1st Right Place Photo Caption Contest of Season Two! Presenting the top 20 captions for this picture from AP Photo/J. Scott Applewhite via Yahoo! -- GINSBURG: "Is that a Coke can in your pocket, Thomas, or are you just happy to see me?" -- Well, there goes the liberal neighborhood! -- GINSBURG: "Sheesh! Without O'Connor, it's a real sausage-fest here." -- After almost falling asleep listening to Cindy Sheehan's "Bush Killed My Son" story for the 26th time, Judge Thomas had to resort to smacking himself to stay awake. -- THOMAS: "Gee, that new razor does give me a closer shave." -- Sitting through yet another Florida timeshare presentation, the justices mark time until they can ride Pirates of the Carribbean at Disney World. -- THOMAS (thinking): "Looks like I picked the wrong week to give up sniffing glue." -- No one on the court enjoyed being equated with Diana Ross. 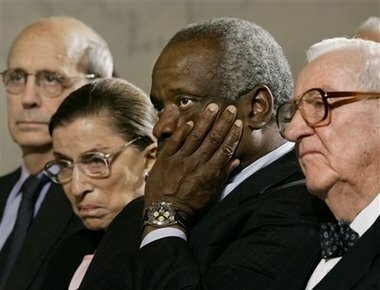 -- THOMAS: "I hate sitting next to Stevens and Ginsburg. It's like I'm in a frakkin' John Carpenter movie between the zombie and the chick whose brains he just ate." -- Justice Thomas to himself: "Lordy, I hope that is Stevens' hand I'm feeling." #10: "Looks like we have two choices left: fifty-fifty or phone a friend." #9: Ginsburg demonstrates she can also sleep while standing. #8: Though his peers had stopped caring long ago, Clarence was still embarrassed by his sagging jowls. #7: GINSBURG: "My 'Stare of Death' will incinerate anyone who ignores foreign laws!" #6: "Kennedy just found binding precedent in French law requiring all Americans to start eating cheese and stop bathing!" #5: "Would someone please tell Justice Thomas to stop making those fart noises." #4: THOMAS: "A 2 1/2 hour movie based on a Disney ride? What the Hell were they thinking? The next time I want to see a pirate movie, I'll rent The Adventures of Long Dong Silver again." #3: Justice Thomas practices his best Jack Benny impersonation for the annual Supreme Court talent show. #2: Black Eyed Peas Reunion Tour --- 2040. #1: Thomas ponders what horrible thing he must have done in a former life to deserve this seating arrangement. I Wonder If He'll Call It "Newspeak"
COMING SOON... OGMEET 2006 POST! Do All On The Left Act Like This?